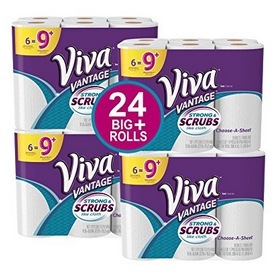 Amazon has these VIVA Vantage Choose-A-Sheet Paper Towels, 24 Big Plus Rolls for only $17.97 shipped when you clip the 20% off e-coupon and checkout through Subscribe & Save! That’s just $0.74 per big plus roll shipped! « Degree MotionSense Antiperspirant Deodorant (4 pack) only $7.98!